Peacefully at the West Park Manor in Winnipeg, Manitoba on Tuesday, March 19, 2019, Mr. Georges Bergeron passed away at the age of 92 years. He leaves to mourn his loving wife of 66 years, Jeannette (née Picard), children, Georgette (Wayne) Rogers, Réal (Brenda) Bergeron, Denis Bergeron, Marie Irvine, Anita (Matt) Bestland, Rachelle (Todd) MacNeil and daughter-in-law Diane Bergeron, grandchildren, Chantalle (Kyle), Melanie (Logan), Nick (Taylor), Daniel (Kelly), Justin (Michele), Joanne (Ryan), Jeffrey (Sarah), Christian, Dominique, Rebecca (Raz), Jamie, Hannah (Derek), Everett, Abby, Luc, Hayden (Kalina) and Mackenzie and great-grandchildren, Chloe, Avery, Devyn, Camryn, Mason, Brady, Emily, Juliette and William. Also left to mourn is his brother Guy Bergeron and sister Germaine Leclerc and sisters-in-law Henriette Lamoureux and Denise (René) Mollot as well as numerous nieces, nephews and friends. Georges was predeceased by his son Normand, great-granddaughter Dyllan and siblings, Claire (Edward), Rita (Leon), Lucille (Gilbert) and Rodolphe, as well as brother-in-law Willy Leclerc. Georges was raised in St. Lupicin, MB. And then moved with the family to Marquette MB. In 1944, when he was 18. He met the love of his life in St. Eustache and they were married in 1952. He then purchased his own farm in 1953 in St. Eustache where he raised his family and remained active in the community until he retired at the age of 75. Georges was very much involved with the Community Club, Parish, and White Horse Plains School Division. Funeral Services will be held in the St. Eustache Roman Catholic Church on Monday, March 25, 2019. 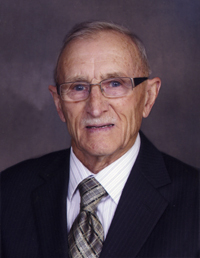 Prayers, eulogy and video tribute at 1:00 pm followed by Funeral Mass at 2:00 pm with l’abbé Michel Nault officiating. Interment will take place after Mass in the St. Eustache Parish Cemetery. In lieu of flowers, memorial donations may be made to the Alzheimer Society of Manitoba, 120 Donald St, Winnipeg, MB R3C 4G2, alzheimer.mb.ca/ or to CancerCare Manitoba, 675 McDermot Ave, Winnipeg, MB R3E 0V9, www.cancercare.mb.ca. Adam’s Funeral Home of Notre Dame de Lourdes, Manitoba in care of arrangements. Phone 204-248-2201. To order flowers, please call 204-248-2201 or click on the SEND FLOWERS link.